“Get those darn things off right now!” our driver grumbles over his shoulder. My daughter, still confused by the breach in safety protocol, shoots me a worried look—her safety belt will not budge. Captain Cliff’s seat swivels around as he reaches out toward my firstborn, jabbing a calloused thumb into the stubborn square at the center of her abdomen. He rises from his seat to get a good look at each of us, making sure that no one in the swamp buggy is actually buckled to it. 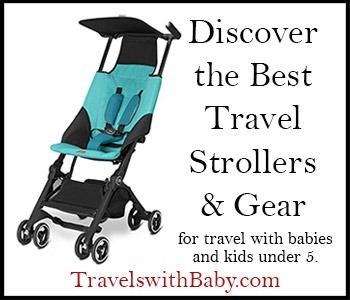 I peer down from my seat on the back row bench guessing the floor of the buggy is at least as far above the ground as I am tall—and, I imagine, with good reason. My husband’s arms extend protectively around our three children seated at his sides. With a couple of spats and a chug we lurch forward toward the road that will take us from our rendezvous point into the heart of Big Cypress National Preserve. We’ve already driven a slow seven miles of dirt road on our own, along which the only other souls we saw were our first night heron (as confirmed by our laminated Birds of Coastal South Florida guide), alligators number seven and eight, and an unidentified serpent slithering over the road as my foot leapt from the gas pedal. The swamp buggy crosses half-way over a canal, but then slows to stop. For some reason, the engine shuts off. “San Francisco,” the kids whisper back. “NINE!” they shout back, suddenly pointing to the water beside us. My son climbs onto his sisters for a better view. We gather at the railing, gazing down at the glistening crags of the foreboding island below. The children’s faces are alight. 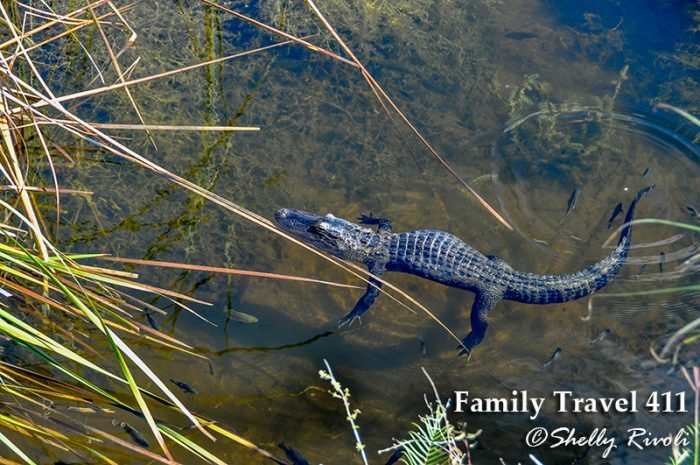 A small female American Alligator in Big Cypress National Preserve. It’s as if they’ve been waiting for someone to ask them this all their lives. Cliff nods, surprised but pleased, as the three siblings quickly exhaust the list. “That’s pretty good,” he grins. “But do you know how you can measure an alligator when all you can see are the bumps of his eyes and nose sticking up from the water?” They fall silent as he explains. I give my husband a quick wink and he grins back in one of those rare moments when two parents feel they’ve done something very right by their children. A sigh of relief escapes me as I remember an awkward conversation with a friend just weeks earlier. There was laughter, including my own. But secretly, I still worried about the final outcome of our trip, particularly this 3-hour “swamp buggy tour” of Big Cypress National Preserve, the unsung neighbor of the Everglades. It might be everything my budding wildlife biologist and survival enthusiast children could hope for. Yet I knew in my gut the excursion still had potential for disaster. Three hours riding in the swampland’s answer to a tundra buggy—without the polar bears? Would it just be too long? Too boring? Too hot? Or worse: Too buggy? And, as I’d confirmed by phone when making our non-refundable booking for five, with only a bucket for a bathroom? “Now, so far, the alligators you’ve seen out there along the highway and canals are either the females or the juvenile males. This here is a small female.” In the surprisingly clear water, she almost appears to float on air. A school of fish encircles her motionless snout, oblivious to the proximity of their demise. “The giant breeder males,” Cliff continues, “are over on this side,” he gestures to the road ahead of us. “Giant breeder males?” I test the words aloud, stifling a laugh. With a spat-chug-spat, the swamp buggy engine fires up and we roll on past the canal, past the sign reading PERMIT REQUIRED, as Cliff tells us how the alligators we’ve already viewed from the platforms at the Everglades and Big Cypress Visitors Centers, and along the Tamiami Trail, were nowhere near the size of the ‘giant breeder males’ who would fight to the death—and even eat—any other male who came near him or the gator hole he currently occupied. And it’s these wet depressions, made deeper and wider by their resident gators, that give rise to the cypress domes, “Like that one there.” He points across a sweep of prairie grass to where a group of trees arcs against the Florida sky, the tallest trees growing at the center where the deepest water lies. Off we go in the swamp buggy into the heart of Big Cypress National Preserve. I try to imagine a one-and-a-half story house turned on its side—with teeth and a tail. “Definitely not!” I shout from the back row bench. Trees begin closing in on both sides of the buggy and ping-ping-pinging against the soldered pipes at our sides as we lean in to avoid the occasional whap of a too-long branch. Cypress boughs drag over our roof of camouflage tarp and flop down behind us as we pass through what feels like an arboreal car wash. There are two types of cypress trees in Big Cypress National Preserve, Cliff points out, and we’ve arrived at a convergence of both. He shuts the engine off and reaches out past the railing to break off a sprig of each. His driver’s seat swivels toward us once again and he shows us the difference between the wild tangle of deep green pond cypress needles and the neat and orderly fine needles of the key lime-colored bald cypress. The pond cypress is evergreen. But each winter the bald cypress sloughs off its needles. Eye-level with the cypress boughs in Big Cypress National Preserve. A tale of two cypress: Pond cypress needles to the left and bald cypress needles to the right. The kids tear at their leaves, rubbing them with great fervor against their necks and cheeks and the backs of their hands, the only parts left exposed beyond the insect-repellent-treated clothing I’d insisted they wear for the day. The kids stare off between the trees a moment, as if expecting a tribe of Seminole or Miccosukee to suddenly materialize. The children nod back in silence and continue staring out at the wilderness surrounding us. Not a building, not even a telephone pole is in sight. “Now the other thing you can do with wax myrtle,” he begins stripping back the thin bark of his twig, “is to brush your teeth.” He rubs the thin white stick against a crack in his smile to demonstrate. As the sun rises higher, the parched surface of the road becomes a near-blinding white. It’s a strange road–not exactly dirt, and though gravely in places, not gravel. To our left, a field of prairie grass and pine trees has Cliff’s full attention, and he slows to point to a mother deer and two fawns watching us roll by. A little farther down the road he stops. “I love hammocks!” my younger daughter exclaims. Cliff points to a pine hammock in the distance, the opposite of a cypress dome. He explains how a hammock is a raised area that continues to build on itself as debris from a group of trees collect beneath them. Over time it makes a small hill, and in the swampiest months of May through December, the island-like hammocks are an important last retreat for the land mammals. Naturally, this captive supply of fauna also makes the pine and hardwood hammocks all the more attractive to south Florida’s invading Burmese python—the population now thought to be around 100,000 between the Everglades and Big Cypress. 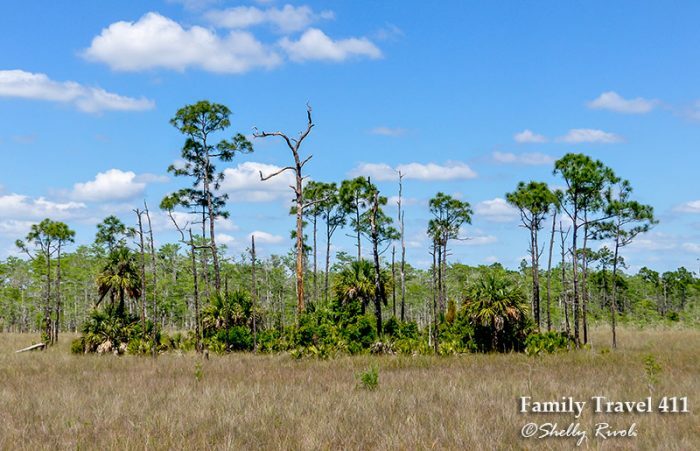 A young pine hammock in Big Cypress National Preserve. “Trouble is,” Cliff explains, “the pythons don’t have any natural predators here,” the exception being an occasional giant breeder male alligator, he is sure to point out. Otherwise, the American alligators don’t seem to be making a dent in the Burmese python population boom, and even a 30-hour duel documented by wildlife researchers between a 13-foot python and a 6-foot alligator ended in a draw. Though the python managed to finally swallow the exhausted alligator whole, as is its custom with prey, the alligator’s feet eventually broke through the python’s sides in protest. In the end, neither side lived to tell the tale. Cliff points to a tall, dead tree at the center of the hammock, much taller than the others around it. He explains that the tallest pine trees are easy targets for lightening, and when they’re struck, the sap inside transforms into a highly flammable resin. “Lighter pine,” Cliff digs into his pocket and removes a splinter of wood, “is bug-proof.” While early Florida developers were anxious to harvest and build pest-proof houses with this valuable lumber, they soon realized the folly of their ways. Lighter pine, sometimes called fatwood, ignites more easily and burns more intensely than regular wood–even when wet. When a pest-proof house caught fire, there was no way of putting it out. Our guide shows us how steadily and hot a splinter of lighter pine will burn. We sit there a moment, the five of us looking at each other, then looking at Cliff. It is ominously quiet. For a 720,000-acre preserve populated by wood stork, egrets, anhingas, ibis, assorted raptors, and several types of heron, you’d think at least one of them would have something to say. “The wind?” my youngest daughter asks. But there isn’t any wind, no breeze to be had in the heat. No leaves rustling. No branches creaking. It’s as if even the trees are holding their breath for some reason. “Good,” he nods at the kids. “Is it a bromeliad?” I ask. 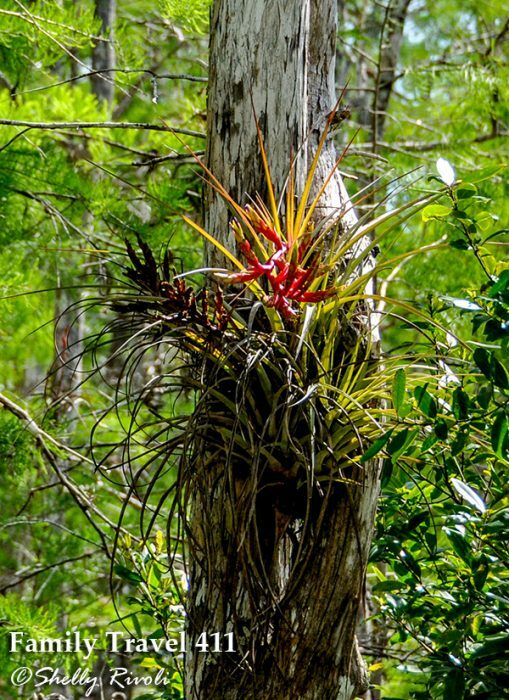 Bromeliads bloom with wild abandon in Big Cypress National Preserve. 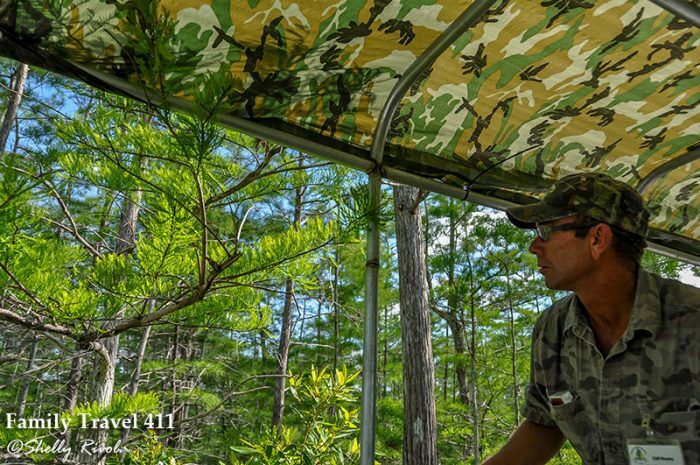 “Yes, ma’am.” He explains that more than thirty types of orchids can be found in Big Cypress National Preserve, and proceeds to point out three we can see just from our current vantage point on the swamp buggy: two growing on trees and the third growing on the ground. Thirty-six orchid species can be found within Big Cypress National Preserve. “Well, how about that…” Cliff leans over the rail of the swamp buggy. “Come take a look,” he whispers, the kids already ejecting from their bench. “Do you see it there?” He points. “A panther!” the kids squeal. They spot a companion track near it, just where the grass begins to thicken. I squint toward the trees that the tracks point toward, but see nothing but cypress and bromeliad. Before I can absorb the fact that he is serious, the kids are scurrying down the ladder behind him and leaping from its last rung. My husband wastes no time following.